Meet a McHenry couple who are sharing their dreams and revitalizing their newly acquired business. Cheryl Kern was looking for something new, after serving as a McHenry County realtor for 22 years. Adam Kern, her husband of 41 years, had spent the past three decades working in the heating, ventilation and cooling (HVAC) business, most recently as co-owner of a local HVAC company. He, too, wanted a new challenge and yearned to run an operation of his own. 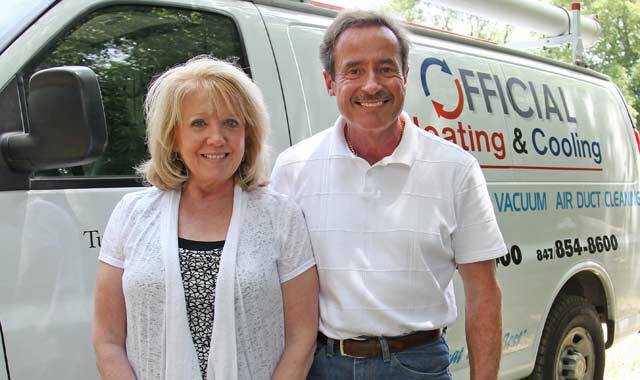 Things fell into place for the couple when the owners of Official Heating and Cooling in McHenry retired last fall. The Kerns jumped at the chance to purchase the 26-year-old business. Official Heating and Cooling, 1401 North Dr., offers sales and service of heating and cooling units, air purifiers and boilers. A factory-authorized Carrier dealer, the company handles everything connected to HVAC work, including humidifiers and indoor air quality issues. Official Heating and Cooling has 12 employees, including sales, office and service staff. Cheryl’s main responsibility is overseeing the bookkeeping and familiarizing herself with the HVAC business. “I’m learning new things every day,” she says. The team includes Lexie, the Kerns’ German shepherd, who comes to work most days, and even rides with Adam on various service and sales calls. “She’s also our director of security,” quips sales manager Ben Martorano. Mary DeFrancisco is one such employee. She joined the company five years ago and is now the office manager. She’s the only employee who also worked for the previous ownership group. Official Heating and Cooling focuses primarily on residential business, but also does some commercial work. Adam comes from a residential background. For years, he was involved in handling HVAC work in downtown Chicago factories that were turned into residential lofts. Another major decision was tightening up the geographic service area. With fuel costs rising, Adam decided it was no longer feasible to travel great distances for service calls. He and Cheryl redefined the company’s coverage area, now as far south as Elgin, north to the Illinois border, west to Harvard and east to Lake County. “By concentrating on a smaller area, we’re able to provide our customers with the best possible care,” Adam says. When the air conditioning went on the fritz in his son’s home in Hampshire, Al Butti called on Official Heating and Cooling. Technicians came out and immediately addressed the vibration that could be heard in the unit. Faulty bearings were to blame. Preventative maintenance is a must. Ducts should be cleaned at least every 10 years. Filters are to be inspected every month. Be careful, however, when it comes to buying expensive filters, Adam says. They don’t always allow air to properly flow through, which can be problematic for equipment. That’s why experts advise scheduling fall and spring cleanings well in advance. For the past several months, the Kerns have been solidifying the company’s business plan. They expect to hire additional service techs and installers in the near future. “I’m pleased with the results that we’ve seen in the short time that we’ve been here,” Adam says. “I’m encouraged by the fact that we overcame obstacles such as a mild winter, which didn’t help our bottom line. But with the weather starting to cooperate and the economy hopefully rebounding, I can see that future growth is definitely on the upswing. This entry was posted on Wednesday, June 27th, 2012 at 11:59 am	and is filed under Northwest Business Magazine. You can follow any responses to this entry through the RSS 2.0 feed. Both comments and pings are currently closed.